Shimano's Saint Pedals are designed to take a beating, with ultra strong chomoly axles and precision ball bearings. Compared to the previous Saint pedal, this model features an updated platform that's 3mm wider and concave in the center, providing comfort and efficiency on longer rides. Shimano has also managed to shave 8.5mm of the stack height, improving cornering while lowering weight. New replaceable pins provide excellent traction. The Saint PD-MX80 Pedals feature a two tone Black/Silver finish with Gold accents. Claimed weight: 500g/pair. I switch between clip less and platform pedals depending on the type of terrain I ride. The saints are the best platform pedal I used so far. Western Bike Works were very good in customer service and fast shipping and delivery. They do there job and I don't have to think about them. High praise. Adjustable, super grippy, wide, slim pedals! I've been moving away from clipless pedals lately and have been spent a lot of time researching platform pedals. These have a number of great features that are missing from other pedals. They are easily adjustable and use angular contact bearings which distribute force between bearings better than sealed bearings can. The pins are removable from the opposite side, so if one gets sheared off or bent, they can still be removed. This is a serious problem with most lower-price pedals with pins. The pins are one length, with a washer installed by default, so if you need longer pins, just remove the washers. The stance is wider than I was used to with my single sided clipless pedals, but I adjusted fairly quickly. Price match through Western Bikeworks is easy! This pedal really made a huge difference from the stock pedals that came with my new mt bike. They are a solid platform,light but strong,and provide excellent grip. These are simply the best pedals around... Once you do the following Remove all of the screws that are in the pedals. Take the spacers off of the screws and throw them away. Put the screws back in. Then add the additional (included) 4 screws (each pedal) to the outsides of the pedals. Why they aren't installed from the factory is beyond me. Once you do this, you will have the best platform pedals money can buy! I'm health conscious recreational bike rider doing100-200 milesweek in the warmer weather. These Shimano Saint PD-MX80 Pedals were originally recommended by my local Bike Store. 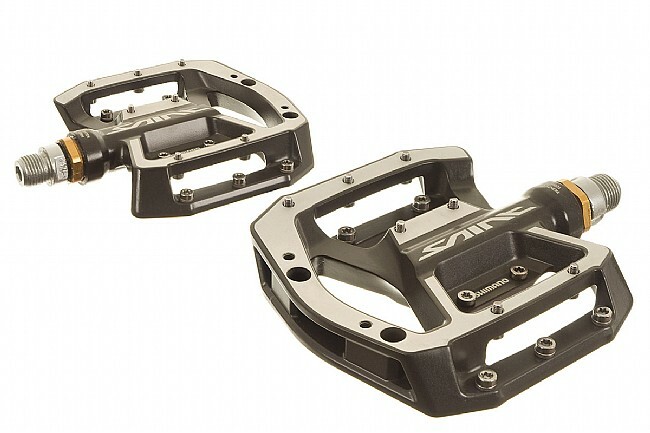 I now have two Cannondale Quick Bikes (Quick 4 and a Quick 2) and have purchased these pedals for BOTH bikes. My feet regularly develop callouses and my ability to adjust these pedals allow me to have a comfortable pedal motion on my rides! I use these peddles mountain biking and they work great!